The latest American Institute of Architects study predicts that nonresidential construction industry spending in the U.S. will increase by 4% through 2019. The institutional sector is expected to grow by 4.5%, compared to 3.4% for commercial/industrial. The AIA report also found that public safety (5.9%), education (5.2%), industrial (4.9%), healthcare (4.4%) and office (4.1%) projects will see the most spending in 2019. With each year comes advancements to the construction industry, and we look at the top trend you should expect to see in the construction industry in 2019. Virtual reality has been an emerging trend in many industries over the past few years, but when compared to augmented reality’s uses and benefits, it quickly feels outdated. While virtual reality can only replace the real world through a simulated environment, augmented reality creates and enhances replicas of the real world for a better view of the project as a whole. Accuracy is obviously very important in any industry, but especially the construction industry, where an inaccurate prediction can waste time and huge amounts of money and resources. AR gives the team a walkthrough of the entire project, with specific details down the exact measurements. Real-time visualizations allow designers and architects to take the guesswork out of the equation, which allows them to not need to rely on manually recorded measurements or drawings. This leads to more efficient planning, and saves the time and effort of the team because they don’t need to build different design option plans. Using AR, architects and designers can collaborate and analyze the space, oftentimes leading to better design. With AR, they can walk through the project, proactively catch any design flaws and make adjustments easily. Augmented reality takes the guesswork out of the the project, which enables more accurate timelines and estimated costs. Augmented reality is a huge technological advancement for the construction industry because it allows for a more streamlined approach in every aspect of the project. With AR, architects and designers are able to save time and money, while giving better design insights, and accelerate the construction process. QuestionPro Audience provides our clients with access to more than 20 million active respondents, including our General Contractor panel. Our General Contractor panel offers unparalleled value by providing big box stores, such as Lowe’s and Home Depot, a front row seat with professional home builders and industrial contractors. It is one of a handful in the continental U.S. and consists of more than 80,000 highly engaged, pre-screened general contractors who provide critical insights. With industry knowledge, innovative tools, and purchasing power, QuestionPro Audience always meets the rigorous demands of our clients. The U.S. packaged foods industry is a $378 billion year industry, and it is facing changes in the upcoming year, particularly in the packaged foods sector. Consumers today are turning away from the mass-produced pantry staples of national packaged brands and turning to healthier, local and more “authentic” food. Large packaged foods companies like Kraft, Kellogg and ConAgra, have reported a decline in sales, as consumers are moving towards fresher options. Kellogg saw a 5.7% decline in the breakfast foods category, which makes sense as breakfast routines are changing. Kellogg’s Special K brand was created with calorie-counters in mind. Now that the diet trend has shifted to low carb/protein, Special K is losing traction with consumers. Instead of carb heavy cereals like Kellogg’s Special K, consumers are seeking on-the-go options like Greek yogurt and protein bars. Kraft also saw a decline in sales of their Mac & Cheese and Velveeta products, explaining this reflects changes in consumer preferences. 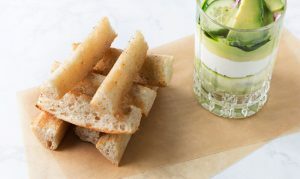 As more consumers focus on sugar as a primary source of unnecessary calories and connect it to unwanted weight gain, brands will need to re-engage shoppers with more nutritious options. Many packaged food companies are working to reduce ingredients like sodium, sugars and fats, and are making commitments to remove “unnecessary” calories out of their products. A recent study found that 71% of consumers read the sugar content on ingredient labels, and 46% strongly want to reduce their consumption of sugar. Manufacturers are trying to win back sugar-conscious consumers by highlighting the reduced amount of sugar in their products. The number of products launched with a ‘low/no/reduced sugar’ claim increased 45% in 2017 compared to five years ago. Another tactic packaged foods companies are using is to switch the type of sweetener used or substitute with one perceived as healthier. The number of products carrying a ‘no artificial sweeteners’ claim has increased 4.4% from a year ago, and products with ‘no added sugar’ claims are up 2.6%. Regardless of their chosen strategy, manufacturers need to re-engage consumers with more nutritious options if they want to preserve their place in the market. QuestionPro Audience provides our clients with access to more than 5 million active consumer respondents, who are pre-screened and qualified candidates for high-quality data collection. Our Consumer Packaged Goods (CPG) Panel is carefully recruited to target all type of users, but also taking into consideration certain key industry trends, such as online store preference, physical store preference, actual systems, reasons to purchase, etc. QuestionPro Audience has been instrumental in product development and brand positioning for many partners, including CVS, Walgreens, Microsoft, among many others. Contact us for your next research project: sample-projects@questionpro.com. October was a great month for data and research. We scoured the internet to create our top 5 infographics list for the month of October. They vary from climate change to food trends for 2019. Enjoy! Foodies, take notice! 2019 is the year for African, Israeli and Japanese infusion. Vegan and raw foods will take precedence over the pork belly trend of 2018. For the drinkers, Aperol frose looks to be the front runner for summer 2019. All in all, I’m looking forward to eating my way through 2019. This next infographic is for every social media marketer. Content is king in marketing right now, and it can become overwhelming to deal with the day to day social media tasks. Post Planner put together a list of 21 tools to help marketers shoulder their social media burden. Only 2% of all Americans say they’re currently at their dream job, according to MidAmerica Nazarene University. 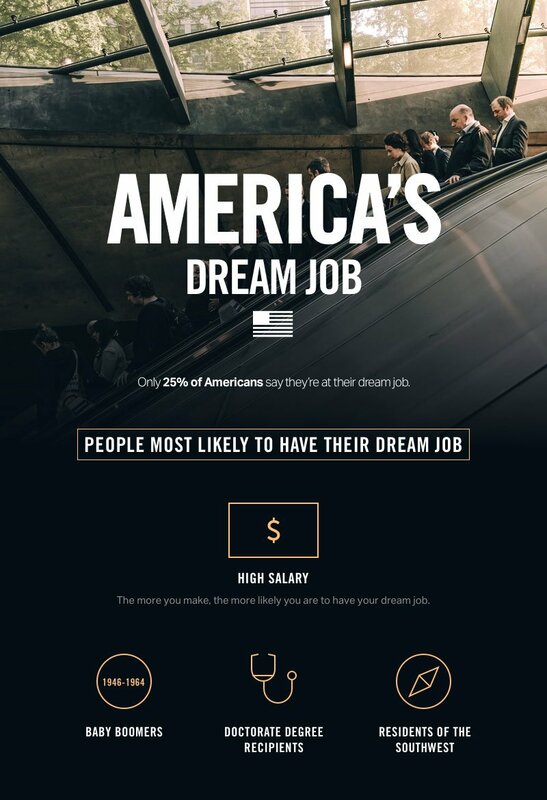 They recently surveyed 2,000 Americans and asked them everything about their perfect dream job, from salary to location, industry, perks and more. Climate change is a very real thing that affects everyone. Scientists say that without significant changes, farming’s global warming footprint will grow rapidly in the next few decades. This infographic shows how farmers can make a change. According to Invespcro, welcome emails are so important that they result in four times more open rates and five times more clicks than regular email marketing campaigns and the average open rate for welcome emails is 50%, which makes them 86% more effective than standard newsletters. It’s no secret that the pet food industry is booming, and will continue to grow in 2019 due to two important factors: humanization and premiumization. Pet owners are already buying the amount of pet food they need, so the quantity can’t go up. Instead, growth is due to pet owners buying the best products for their pets. Premium pet food sales are continuing to increase, whereas other areas are seeing drops in growth. A recent report from Euromonitor International found that in 2017 premium dog and cat food sales made up more of total value sales than economy and mid-priced sales combined. As pet owners in the U.S., perhaps more than in any other country, treat their pets as integral members of their families, the price they are willing to pay for their beloved’s care has gone up. Dog food sales grew 8% between 2012-17 to reach $11.8 billion, while cat food sales increased 11% to reach $6.83 billion during that period. Snacking is no longer a bad habit for humans; 1 in 11 pet owners say they feed their pet toppers such as sauce and gravy as a snack, and 75% of pet owners say that treats are their way of showing their pet love. With so much money at stake, it is more important than ever for pet food companies to conduct market research, so they can gain insight from veterinarians about the needs of pet owners. QuestionPro Audience has the largest veterinarian panel in the U.S., which consists of more than 40,000 highly engaged, pre-screened veterinarians who provide critical insights. With industry knowledge, innovative tools, and purchasing power, QuestionPro Audience always meets the rigorous demands of our clients. We may be only halfway through October, but it’s not too early to think about the upcoming holidays, and more importantly to many consumers and retailers—holiday shopping. In fact, holiday spending begins in October, not November. And according to eMarketer, all retail sales, whether online or in-store, will grow by 3.8% in 2018, to the tune of $691.9 billion. The average consumer plans to spend 5% more than they did in 2017, an average of $1,250 each, on travel, gifts and entertainment this holiday season. Which makes sense, due to high employment rates and consumer confidence, which just hit an 18-year high. 70% of consumers are planning to shop at online-only retailers this holiday season, with 42% planning to shop at discount stores, 24% at national chains, and 23% at department stores. The retail industry has primarily been identified as either brick-and-mortar or online retailers, and retailers are looking to maximize sales in-store and online. In-store foot traffic fell 7.5% in November and December 2017, whereas U.S. shoppers are predicted to spend $119.99 billion online in the months leading up to the holiday season. Traditional store retailers are finding ways to drive traffic to stores with better values, in-store only promotions and more entertaining shopping experiences. Online retailers are looking to lower the number of abandoned digital shopping carts by offering lower prices and shipping options that are free and/or get products to consumers faster than ever. One new avenue for ecommerce shopping this year are digital voice assistants. According to Pew Research, 46% of Americans used a digital voice assistant in 2017. We conducted a study which found that 4% of digital voice assistant owners use them to purchase items, which is on trend with the prediction that 3% of purchases will be made via voice device during the 2018 holiday season. In fact, many retailers have already developed skills that can help shoppers buy online with just a few words. Free still speaks to consumers. With Amazon Prime, fast delivery and free shipping are becoming the norm, and retailers have taken notice. As a shopper, how many times have you gotten to checkout, only to realize shipping is $5.99 and decided to bail? Retailers want to close sales this holiday season, so they are incorporating free shipping as a way to entice shoppers to spend their money with them. The U.S. midterm elections on November 6th are only weeks away, and there has been much debate and discussion over the highly anticipated outcomes. Republicans currently hold two-thirds of the governor positions across the country, but this year, 26 of those seats are on the ballot. In the Senate, there will be at least 10 states that are predicted to be extremely close in votes. Voter turnout is of great interest to both the Republican and Democratic parties this election. A recent study found that Democrats are more politically active than Republicans ahead of the midterm elections. More than half of registered Democratic voters surveyed have attended a political rally, protest or campaign-related event in the past year, compared to 40% of Republican voters. Need to gain insight into voter behavior? Look no further. Your campaign’s voter file is the foundation of your outreach and will shape your strategy. Why trust anyone but the best? QuestionPro Audience’s Registered Voter panel provides academic researchers, pollsters and campaign managers, among others, with access to the first nationwide panel of likely voters to conduct online polling, ad testing, focus groups and in-depth interviewing among registered voters across the United States. Our voter panel consists of authentic, well-screened and profiled respondents. The panel members are all fully incentivized by our reward structure, which results in highly active survey participants and optimum data quality for your project. This dedicated panel harnesses the power of web, social media and mobile technology to address key industry challenges where traditional phone-based data collection has failed—speed, accuracy, feasibility and cost-effective research. With industry knowledge and innovative tools, QuestionPro Audience always meets the rigorous demands of our clients. Contact us for your next research project: sample-projects@questionpro.com. Americans traveling solo is at an all-time high right now, particularly among millennials. Travel, in general, is easier than even a decade ago. With smartphones, we’re able to research and book travel plans, but once you’re there, activities cost money. Luckily, RetailMeNot recently conducted research to find out which U.S. cities are best to travel to alone when on a tight budget. Here are the top five. Jacksonville is located along the Atlantic Ocean in Florida. With more than 20 miles of beaches, 10 state and national parks, and a vibrant nightlife scene, it’s no surprise it made this list. Jacksonville Beach Fishing Pier only costs you a dollar, and the Jacksonville-Baldwin Rail-Trail (cost: $0) is a 15-mile paved path for bikers, walkers and joggers to enjoy. New Orleans is known for Bourbon Street, but has so much more to offer. The Woldenberg Riverfront Park is 16 acres of green space for you to relax in and enjoy. The French Market is an open-air market that features six blocks of art, handmade crafts, produce, and delicious eats. The Capital city is known for being on the pricier side, but it doesn’t have to be. Take your pick of landmarks to tour that are entirely free of charge: the White House, Library of Congress, National Zoo, National Air and Space Museum, United States Botanic Garden, and so many more. Texas’ second-largest city has rich history, and it doesn’t disappoint. Hemisfair, a series of urban parks that are home to various structures dating from the Spanish Colonial era, provide history and the perfect place to unwind. The San Antonio River Walk is an urban waterway on the San Antonio River in downtown San Antonio (say that three times fast), lined with restaurants and shops. Located in the heart of North Carolina’s Blue Ridge Mountains, Asheville has a thriving art and restaurant scene. It’s also a hiker’s paradise, as the Blue Ridge Mountains offer hundreds of trails, ranging in levels of experience. The Botanical Gardens are free to explore, though donations help maintain the grounds’ 10 acres. Over the past ten years, the relationship between pet and owner has taken on a new meaning. With Americans waiting until later, if at all, to start a family, the bond with their pets has grown stronger, and young Americans are leading in their rate of pet ownership. The pet industry has seen changes like the popularity of grain-free food and pet technology. Now, the focus is on CBD oil for pets. Just as people are increasingly taking cannabis to ease their ailments, pet products with cannabis are on the rise. Cannabidiol, or CBD, is a non-intoxicating chemical compound that comes from the cannabis sativa plant. Unlike THC (tetrahydrocannabinol, another cannabinoid) CBD doesn’t get users high. Scientific research has shown that there are many legitimate medical uses for cannabis. Once cannabis was proven to help humans, pet products seemed to be the natural progression for many cannabis supporters. At SuperZoo 2018, the largest national show for pet retailers, there were an increasing number of products with CBD and hemp oil on display. Many pet owners are finding that cannabis oil serves as an alternative to traditional medicine, providing many of the same benefits without the side effects. It is estimated that up to 5% of dogs suffer from seizures. Typically, these dogs are put on drugs like phenobarbital and potassium bromide. While they may help control the seizures, they can be extremely harmful to your dog’s liver. Additionally, CBD has been shown to work with drug-resistant epilepsy. In one study, 7 out of 8 patients with epilepsy that was resistant to drugs saw an improvement within 4 to 5 months of taking CBD. The biggest money maker in the pet industry right now is healthcare, particularly veterinary care. In 2016, $15.42 billion was spent solely in veterinary care, up 2.5% from 2015. Judging by the recent growth in the pet care market, the pet medicine opportunity for cannabis is too large to ignore.